I typically set the menu and do the cooking, while Mr.Dr. provides the wines. This year however, I managed to butcher myself with a dull knife on the first day of cooking. Eleven stitches and an admonishment by the doctor not to get the stitches wet or dirty meant Cathy shouldered most of the cooking while I took care of the baby and directed her. Mr.Dr. was good enough to come early on Saturday and help finish three of the courses. The theme for the dinner this year was French Regional Dishes with Wines from those same Regions. Basically, we were working with the idea “if it grows together, it goes together.” Since our ingredients were not actually from the region, it was not a perfect test, but it was close. Mr.Dr. and I agreed that the wines should not necessarily be the best from the region, but should be the most expressive and representative of the region. I have a very large family (I am the oldest of seven children), and a very small dining room. This tends to make the guest list tricky. I would love to invite the entire clan, but it just isn’t possible. Instead, I try to alternate as best I can. This year, the dinner was on my brother Matthew’s birthday. My sister Emily agreed to watch his one year old daughter so he and his wife could come, provided that leftovers were sent back as payment. 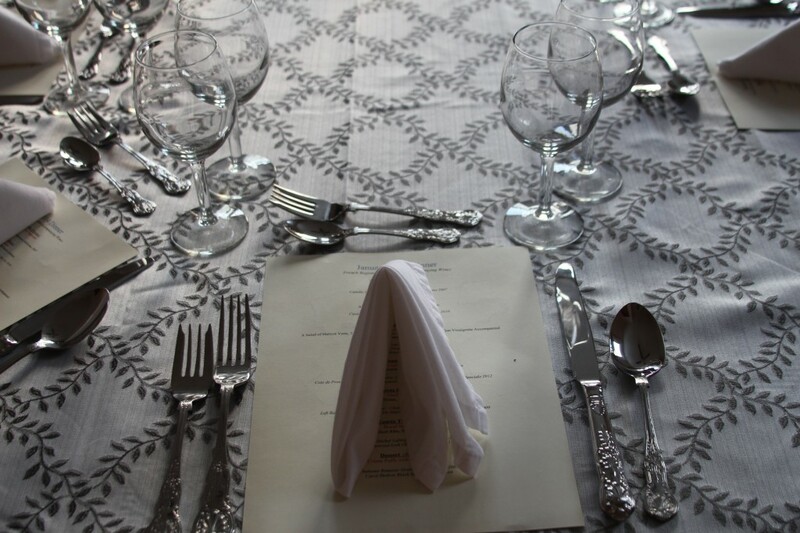 Normally when I write about a dinner, I do it in stages; Introduction, menu, process, analysis, recipes, wine. With this many courses and wines, I am going to change it up a bit. I will present the course, our analysis of it along with the wines, then put the recipes at the end. Molly, asleep in her swing. This is a very easy start to any dinner party. It is pathetically simple to make, but impresses everyone. The tapenade was good, no doubt, but the star of this course was the Champagne. The fact that the vintage is listed on the bottle should be the first clue that it will be a good wine. It did not disappoint. It was crisp and dry, with a good minerality to it that went well with the saltiness of the olives. Quiche Lorraine – An Egg and Cheese Pie with Bacon Lardons. The appetizer was plated and waiting on the table when the guests arrived. Quiche may not seem elegant, but it is delicious. The Muscadet was supposed to be an Alsatian Reisling, but there was a mix up along the line. Never fear, it went quite well with the Quiche. 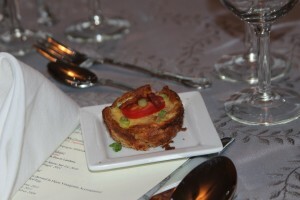 The Gewürtztraminer was a delicious wine, but did not go particularly well with the quiche. Most agreed the Gewürtztraminer was the better wine, but the Muscadet was the better pairing. 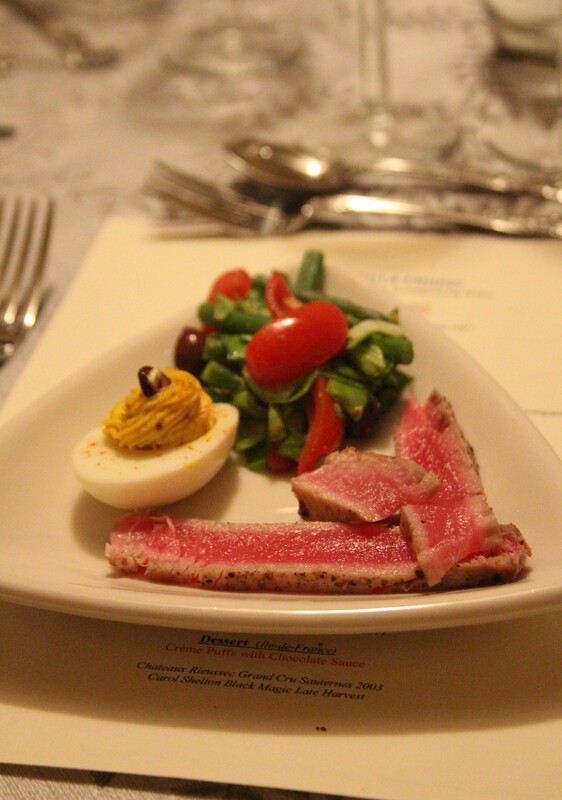 Salad Niçoise – A Salad of Haricot Verts, Tomato, Niçoise Olives, and Lettuce dressed in Dijon Vinaigrette Accompanied by Seared Tuna and Deviled Egg. Salad is salad. It is hard to class it up unless you are Thomas Keller. We did our best with this and I think it came out fairly well. The room was divided on which wine paired best, the Pouilly-Fuisse, or the Sancerre. I felt the Pouily-Fuisse was the better wine, but the Sancerre was the better pairing. The Savennières was purchased on a whim based on a review. In my opinion, it was undrinkable. It was horribly bitter and lacked any redeeming qualities. Some others in the room thought it was ok with the food. They were wrong. This soup was shockingly good. It is a basic vegetable soup with noodles. However, the addition of the pesto elevated it to something extraordinarily tasty. Both wines were quite good, and did a good job of representing the Provence area of France. 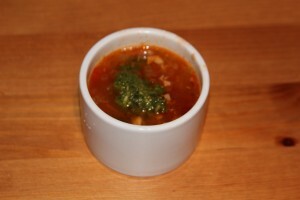 I believe the Cote de Provance Rouge did a better job with the soup, but either selection would be a winner. Duck Cassoulet – A Casserole of White Beans, Sausage, Bacon, and Roasted Duck. This is the dish that I cut myself on. It takes 3 days to make properly and is far more work than anyone should do for elevated beenie-weenies. That being said, it was delicious. The time it takes to make gives the flavors time to meld and develop. It was creamy, savory, and meaty all at once. Either wine would be a winner with this dish, but my own prejudice against Merlot based wines had the Left Bank Bordeaux the winner. It had the spice bite that comes with a good Cabernet needed to cut through some of the creaminess of the Cassoulet. Boeuf Bourguignon – A Stew of Beef Short Ribs, Bacon, Mushrooms, and Onions. I have never been so happy to have a corked bottle of wine. I replaced the offending bottle with one from my cellar and what an upgrade it was. From a so-so mass produced zin to one that I think is the best that Ravenswood makes. I know I know, it isn’t French. 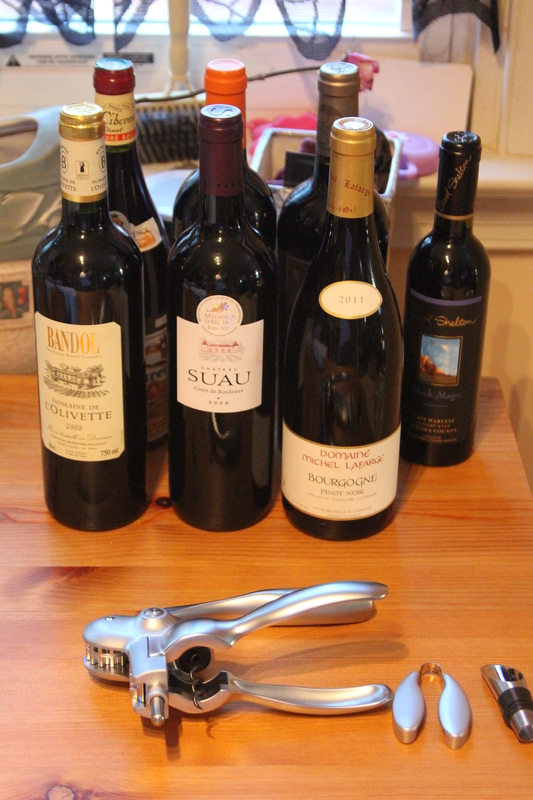 The French have a huge gap in their wines; the inexcusable lack of Zinfandel. We chose to remedy this with a Zin for the beef, and one for dessert. The Boeuf was the best course of the night I thought. It is a Julia Child specialty and was made with all the little flourishes she uses to elevate it from dinner to art form. 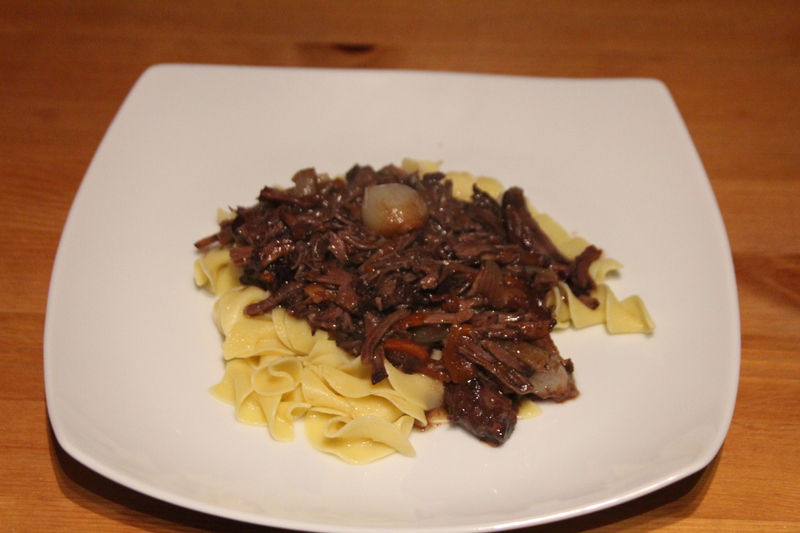 I decided to serve the beef over egg noodles, though roasted potatoes would have been just as good. Had the Burgundy been the only wine there, I would have been happy. It went fabulously with the beef and could stand alone as a wine quite well. However, it was not the only one there. The Teldeschi blew it out of the water. It was a bigger wine, better composed, more balanced, and to top it off, went better with the beef. Much of that analysis is my own love of Zinfandel shining through. So be it. Try it yourself and tell me I am wrong. Light, creamy, chocolaty, delicious. 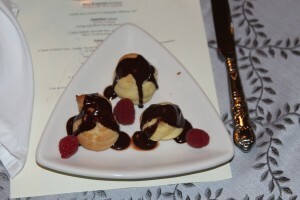 This was Cathy’s first time making cream puffs and she knocked it out of the park. The wines were sublime. The Sauternes was an excellent expression of that region and held it’s ground against the skills of Carol Shelton. 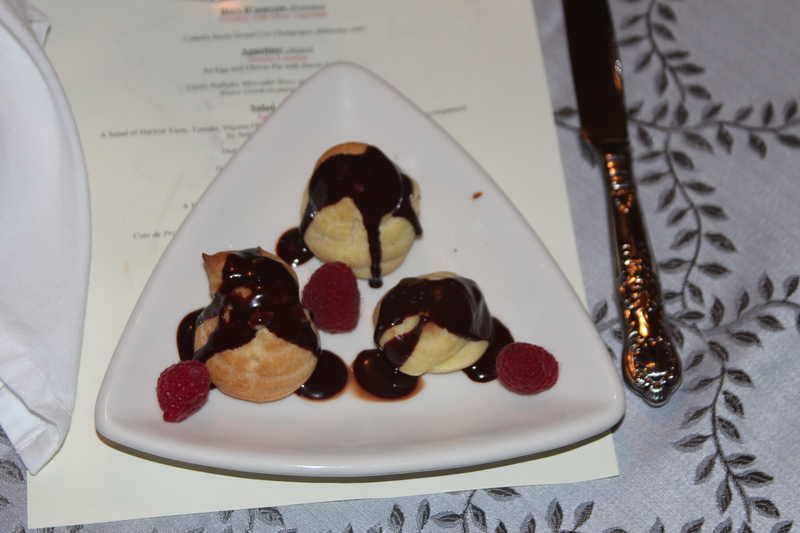 The two wines fought for supremacy, the Sauternes paired best with the cream puff, while the Carol Shelton paired best with the Chocolate sauce. In the end, I declared myself the winner and drank both. 1) Place the cut rounds on a cookie sheet and put them in the oven to dry and lightly toast. 2) Place olives in food processor with a bit of pepper. Slowly drizzle in olive oil as the processor chops until desired texture. 1) Blanch and shock the Hericot Verts and chop into thirds. Slice the tomatoes in half lengthwise. Add all salad ingredients into bowl. 2) Whisk together the dressing ingredients and add to the bowl. Toss until covered. 3) Salt and pepper the tuna on both sides and sear on a very hot pan. When seared, slice into thin strips and add to salad. 4) to make the Deviled Eggs. Shell the hardboiled eggs and cut in half lengthwise. Remove the yolk and place in a bowl. Mash with fork until smooth and add the mayonnaise and mustard. Mix together. Season to taste. Pipe or spoon the mixture back into the egg halves and serve. The changes we made included not using the pork rind, and using a roasted duck instead of duck confit. This recipe is from Julia Child’s Mastering The Art of French Cooking. If you don’t have this book, get it. I’ll not give away her secrets here. This recipe is from Food and Wine February 20114 and was provided by Davidf Lebovitz. We used a vanilla custard instead of a Caramel one that he calls for. This was probably the best meal I’ve ever had. Kudos to Luke, Cathy and the Doctor!